They’re pulled from Grandma’s recipe card box. They spring from test kitchens, crafted by Michelin-star chefs. They hatch from the minds of people looking for a little pocket money—or, necessity being the mother of invention—from folks between jobs and looking for a new future. We mean food in jars. 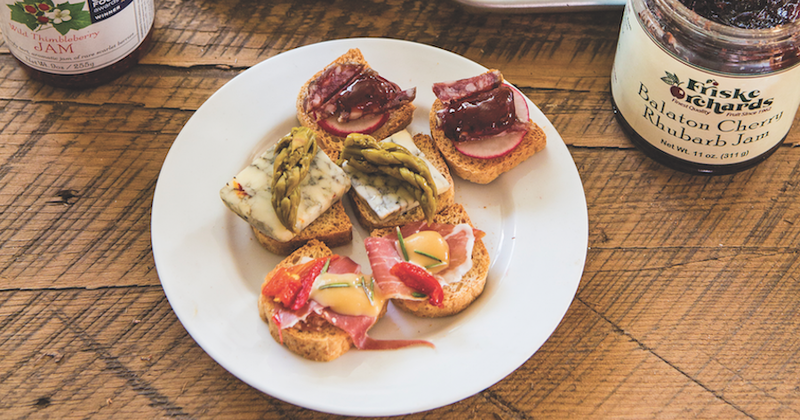 Blue cheese and Michigan Made Pickled Asparagus Fire Stix wrapped with prosciutto and topped with pickled roasted red peppers on crostini made with Stone House baguette. Smoked whitefish topped with pickled shallots, capers, dill sprigs, radish and Brownwood Farms Kickin’ Kream Mustard on flatbread. Prosciutto stuffed with Friske’s Balaton Cherry/Rhubarb preserves topped with arugula. Amish or Maytag Blue cheese, American Spoon foods Honey Crisp Apple Conserve and sprigs of thyme on flatbread. Sliced green apple with dry aged pork belly and American Spoon Foods Thimbleberry Jam on crostini. Of course, jarred foods entrepreneurship is nothing new to veggie-and-fruit-blessed Northern Michigan. Benjamin Twiggs and Brownwood Farms have been making pretty jars of preserves for decades. Food writers credit Justin Rashid’s über-lush American Spoon pre-serves from the early ’80s with helping ignite the local foods movement nation-wide (check out this MyNorth video interview with Justin). Cherry Republic made a name by pairing our A-list fruit with a destination retail experience. Food For Thought has combined a light-on-the-earth ethic with gourmet flavors for more than a decade. So, no, jarred foods are not new here, but the fervor around jarred foods, that is undeniably fresh and electric. “The thing that has amazed me in jarred foods is the explosion of products we are seeing in the past couple of years,” says Evan Smith, chief operating officer of local foods purveyor Cherry Capital Foods. What’s driving it? “No one single thing,” he says. Northern Michigan’s national foodie reputation: people want to be a part of it. The economy: the Great Recession convincing people to take more control over their livelihood. The fun: people just plain enjoy making something tasty and trying to sell it. And, not to be overlooked, Michigan’s Cottage Food Law. Taking effect in 2010, it allows people to make certain prepared foods (baked goods, jams and jellies okay; meats, pickles and salsas not) in their home kitchens without FDA inspection and sell up to $20,000 a year. “That lets somebody make a few dozen of something and try selling it at the farmers market rather than having to find a contractor to make a 100-case minimum run,” Smith says. The entrepreneurial spirit is set free to experiment. And our flavor sensors benefit. Here then, just in time for holiday gifts and entertaining, is a love note to Northern Michigan’s jarred food proliferation. We asked three foodie insiders—Ken Burritt of Burritt’s Fresh Markets, Laurie Cornell, store manager at Symons General Store, and Evan Smith—to pick five of their favorite jarred foods (see below!) and then asked the creative chefs at Epicure Catering, Andy Schudlich and Cammie Buehler, to give us an easy, instant idea for each of the selections. Mini toasts with blue cheese, and Michigan Made Pickled Asparagus Fire Stix. Mini toasts with prosciutto, pickled roasted red piquillo peppers, Brownwood Farms Kickin’ Mustard and sprigs of rosemary. Combine with butter for a tasty wing sauce. Use as a topping for grilled local pork. Perfect accompaniment to charcuterie and cheese … or a bloody Mary! Great for local whitefish or walleye. A delicious and unexpected addition to chicken salad. Serve with a sharp Grassfields Lamont cheddar and crusty bread. Use as a sauce for your farmers market lasagna. Serve with Wisconsin buttermilk blue, your favorite crackers and dark chocolate truffles. Serve with skewered grilled local chicken for an easy appetizer. Mix with coconut milk and a little sriracha as dipping sauce for satay. Serve with whole wheat toast and Michigan Amish salted butter. A no-brainer … add Great Lakes Potato Chip Co. tortilla chips. Combine with balsamic reduction to make a glaze for duck breasts. Serve Thimbleberry Jam on crostini with Idyll Farms chèvre. Combine with a bit of water in a saucepan to make a warm sauce for Shetler’s vanilla ice cream.